• 7 mile trail along the CSX line from midtown to Shelby Farms. • Shelby Farms Park Conservancy is donating $4,775,000 for the purchase. • $1.5 million federal surface transportation grant for construction. • Shelby county contributes $375,000 matching funds to get the federal grant. 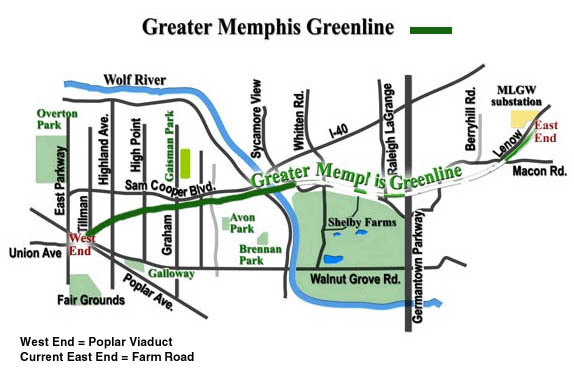 • Shelby Farms Park Conservancy will administer its development. • Completion by Dec 31st 2009. • Mud Island River Park - Share your ideas at 1 of the 2 upcoming public meetings on the park and take the online survey. (You can skip sections if you're short on time. And it's not necessary to give your name or e-mail address, so don't let that stop you.) Click here for meeting schedule; here to take survey. For full contact info. click here.